Background: Cesarean scar pregnancy is an ectopic pregnancy embedded in the myometrium of a cesarean scar. Several types of conservative treatment have been used to treat cesarean scar pregnancy, but no management protocol has been established for this rare, life-threatening condition. The purpose of this study was to evaluate the feasibility of suction curettage as a first-line treatment in early cesarean scar pregnancy. Methods: During a 4-year period, 19 cases of cesarean scar pregnancy were diagnosed at Süleymaniye Maternity Hospital in Istanbul, Turkey. Suction curettage and Foley balloon tamponade were performed as a first-line treatment in 13 patients. Medical records and treatment results of the patients were evaluated. Results: The mean maternal age was 32.5 years (range, 24-39 years). The mean gestational sac diameter was 13.65 mm (range, 7.6-27 mm), and mean endometrial thickness was 10.7 mm (range, 6.7-14.6 mm). A measurable fetal pole for crown-rump length was available for 6 (46.1%) patients. None of the fetuses had cardiac activity. Suction curettage under ultrasound guidance and Foley balloon tamponade were successful as the primary treatment in 13 of 13 patients. No major complications occurred during or after the procedure. Conclusion: Our data suggest that surgical evacuation under ultrasound guidance with Foley balloon tamponade is a safe and successful treatment modality in carefully selected patients with early cesarean scar pregnancy. Because no management protocol has been accepted for this rare, life-threatening condition, each patient should be evaluated individually.6 Several types of conservative treatment have been used to treat cesarean scar pregnancy: dilation and curettage (D&C), excision of trophoblastic tissues, local or systemic administration of methotrexate, bilateral hypogastric artery ligation, and selective uterine artery embolization with curettage and/or methotrexate administration.4,7-10 We present our experience with 13 patients with early diagnosed cesarean scar pregnancy who were treated by suction curettage and Foley balloon tamponade. After receiving ethical approval, we evaluated the patients who had been diagnosed with early (<8 weeks) cesarean scar pregnancy between January 2009 and January 2013. 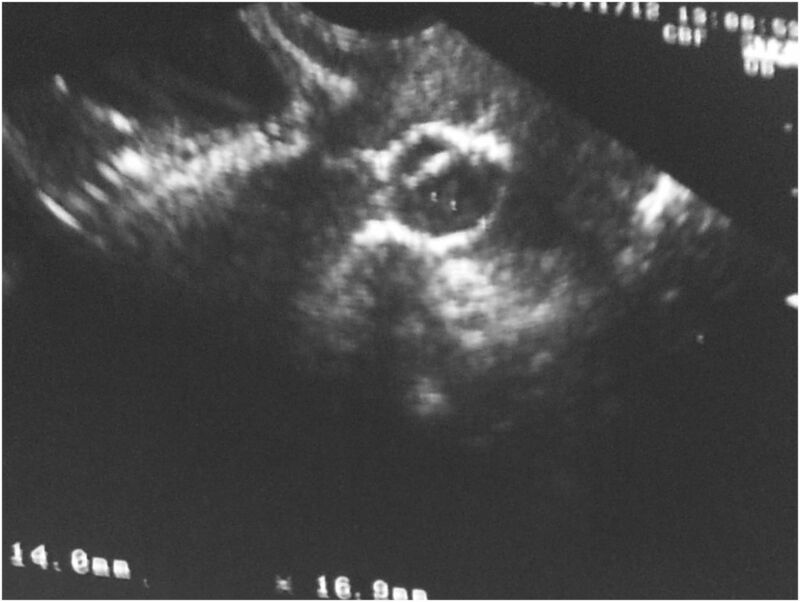 The diagnosis of cesarean scar pregnancy was based on the following sonographic criteria: (1) empty uterus (Figure 1); (2) empty cervical canal; (3) anteriorly located gestational sac with a diminished myometrium layer between the bladder and the sac (Figure 1); and (4) discontinuity in the anterior uterine wall of the uterus on a sagittal view of the uterus after gestational sac (Figure 2). Figure 1. 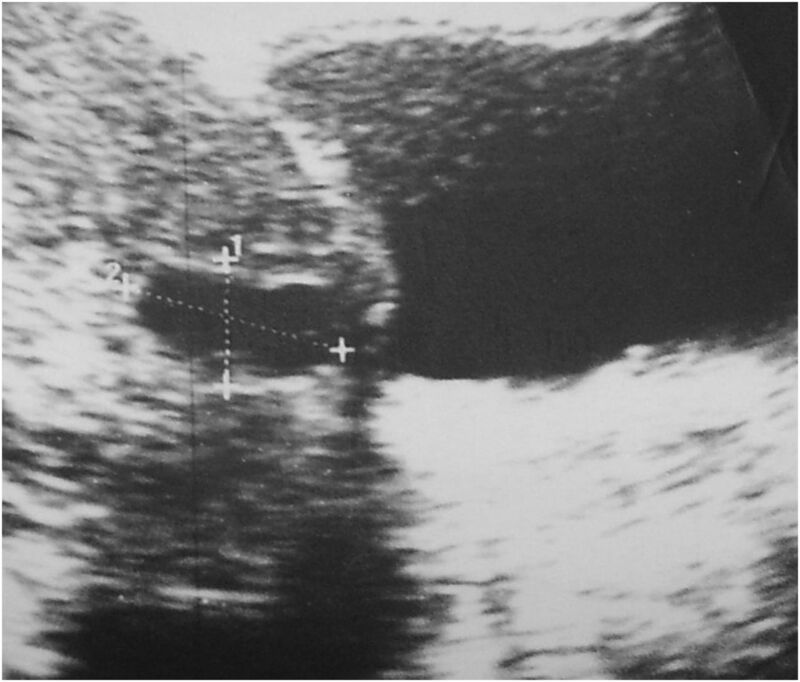 Sonographic view of a cesarean scar pregnancy shows an inferiorly located gestational sac behind the cesarean scar and an empty uterus. Figure 2. Sonographic view of a cesarean scar pregnancy shows discontinuity in the anterior wall of the uterus. Patients who were treated by suction curettage and Foley balloon tamponade primarily were included in the evaluation. Patients who received other local or systemic treatment modalities were excluded from the study. Informed consent was obtained from all patients before treatment. Transabdominal ultrasound-guided evacuations with a standard suction cannula (6-8 mm) were performed under general anesthesia. At the end of the curettage, the bladder was filled by 0.9% sodium chloride, a 16-22 Fr Foley balloon catheter was inserted into the cavity at the level of the implantation site, and the balloon was inflated with 50 mL of saline to decrease the chance of hematoma formation. The Foley catheter remained in the uterus for at least 24 hours. Successful treatment was defined as complete primary evacuation of the cesarean scar pregnancy. Reproductive outcomes, menstrual periods, and recurrence of cesarean scar pregnancy were evaluated. A total of 19 patients with cesarean scar pregnancy were conservatively treated between January 2009 and January 2013. The 13 patients who were treated by suction curettage and Foley balloon tamponade primarily were included in the study. Six patients who were treated with methotrexate therapy were excluded. The mean maternal age was 32.5 years (range, 24-39 years). Four patients (30.8%) had undergone one cesarean section, 7 patients (53.8%) had undergone 2 cesarean sections, and 2 patients (15.4%) had undergone 3 or more cesarean sections. The gestational age according to the patients' last menstrual period at diagnosis was 4 weeks and 5 days to 7 weeks and 6 days. The mean gestational sac diameter was 13.65 mm (range, 7.6-27 mm). The mean endometrial thickness was 10.7 mm (range, 6.7-14.6 mm). A measurable fetal pole for crown-rump length measurement was available in 6 (46.1%) patients. None of the fetuses had cardiac activity. Clinical presentations were vaginal bleeding in 6 patients (46.1%), pain in 1 patient (7.7%), and asymptomatic with delay in menstrual bleeding in 6 patients (46.1%). Asymptomatic patients were diagnosed during the routine first trimester sonographic screening. Patient characteristics are provided in the Table. Suction curettage under ultrasound guidance and Foley balloon tamponade were successful as the primary treatment in 13 of 13 patients. No major complications occurred during or after the curettage. Ten of 13 patients were followed for 2 years after suction curettage. The remaining 3 patients were not available for follow-up. None of the 10 patients had any complaints or menstrual irregularity after suction curettage. Five of 10 (50%) patients became pregnant again. Two patients had term pregnancies, 1 patient had a 28-week preterm delivery, and 2 patients had abortions during the first trimester. None of the patients had a recurrent cesarean scar pregnancy during the follow-up period. Sonography is the first-line diagnostic tool for cesarean scar pregnancy. Doppler imaging may serve as an additional technique to augment the diagnostic capabilities of transvaginal ultrasound. Doppler examination may reveal high-velocity, prominent, low-impedance blood flow surrounding an ectopic gestational sac, consistent with normal early pregnancy.14,15 In our study, all patients were diagnosed by the combination of transvaginal ultrasound and Doppler sonography. Jurkovic et al performed D&C in 8 patients with cesarean scar pregnancy, but 3 patients had significant intraoperative hemorrhage.13 Of these 3 patients, one was initially misdiagnosed as an incomplete miscarriage, and a blind D&C was performed. Seow et al reported a similar experience in 1 of 2 patients treated with D&C for cesarean scar pregnancy.18 In some reports, massive bleeding with suction curettage in accurately diagnosed cases was associated with a bulging sac at the ultrasound examination.19,20 Sac bulging is the protrusion of the gestational sac that changes the outer uterine contour. Sac bulging may be a sign of deep sac implantation and may be a contraindication for suction curettage. Successful results with suction curettage have been reported.21-23 In our study, 13 patients were primarily treated by suction curettage under ultrasound guidance and Foley balloon tamponade without any serious complications. The high success rate in our cases may be attributed to the careful selection of the patients and operative technique. Our patients were all at less than 8 weeks of gestation and had a 13.65-mm mean gestational sac diameter. None of the patients had bulging sac or cardiac activity. Recommending suction curettage as a first-line treatment in selected patients after careful ultrasound examination seems logical. A metaanalysis published in 2018 reported that expectant management may be a reasonable option for cesarean scar pregnancy without cardiac activity, although in almost 30% of these cases, prompt treatment was required.24 We conclude that expectant management with a 70% success rate is not safe enough to make a recommendation. Our data suggest that surgical evacuation under ultrasound guidance with Foley balloon tamponade is a safe and successful treatment modality in carefully selected patients with early cesarean scar pregnancy. Patients with cesarean scar pregnancy less than 8 weeks of gestation and without cardiac activity or a bulging sac may be good candidates for suction curettage. Noninvasive approaches are likely more appropriate for patients with cesarean scar pregnancies that are more than 8 weeks of gestation and have cardiac activity and a bulging sac. Prospective trials are needed to determine the optimal treatment of cesarean scar pregnancy.
. An ectopic pregnancy embedded in the myometrium of a previous cesarean section scar. Acta Obstet Gynecol Scand. 1995 Aug;74(7):573-576.
. Follow up and outcome of isthmic pregnancy located in a previous caesarean section scar. Br J Obstet Gynaecol. 1995 Oct;102(10):839-841.
. Intrauterine ectopic pregnancy. A case report. Clin Exp Obstet Gynecol. 1998;25(3):79-80.
. Methotrexate for cesarean scar pregnancy after in vitro fertilization and embryo transfer. A case report. J Reprod Med. 2000 Sep;45(9):754-757.
. Ectopic pregnancies in a Caesarean scar: review of the medical approach to an iatrogenic complication. Hum Reprod Update. 2004 Nov-Dec;10(6):515-523.
. Cesarean scar ectopic pregnancies: etiology, diagnosis and management. Obstet Gynecol. 2006 Jun;107(6):1373-1381.
. An ectopic pregnancy developing in a previous caesarian section scar. FertilSteril. 1997 Feb;67(2):398-400.
. Ectopic pregnancy in a caesarean scar: a case report. J Obstet Gynaecol Can. 2005 Dec;27(12):1102-1106.
. Successful conservative treatment of a cesarean scar pregnancy with uterine artery embolization. Tohoku J Exp Med. 2005 Jul;206(3):261-265.
. Combination of transarterial embolization of uterine arteries and conservative surgical treatment for pregnancy in a cesarean section scar. A report of 3 cases. J Reprod Med. 2003 Mar;48(3):213-216.
. Pregnancy in a uterine scar sacculus—an unusual cause of postabortal haemorrhage. A case report. S Afr Med J. 1978 Jan 28;53(4):142-143.
. First-trimester diagnosis and management of pregnancies implanted into the lower uterine segment cesarean section scar. Ultrasound Obstet Gynecol. 2003 Mar;21(3):220-227.
. Caesarean section scar ectopic pregnancy: a new problem or new name for an old one? Australas J Ultrasound Med. 2009 Feb;12(1):22-23. doi: 10.1002/j.2205-0140.2009.tb00002.x.
. Observation of cesarean section scar by transvaginal ultrasonography. Ultrasound Med Biol. 1990;16(5):443-447.
. Pregnancy in a cesarean scar. Ultrasound Obstet Gynecol. 2000 Nov;16(6):592-593. Cesarean scar ectopic pregnancy: case series and review of the literature. Am J Perinatol. 2010 Feb;27(2):111-120. doi: 10.1055/s-0029-1224874.
. Systematic review: what is the best first-line approach for cesarean section ectopic pregnancy? Taiwan J Obstet Gynecol. 2016 Apr;55(2):263-269. doi: 10.1016/j.tjog.2015.03.009.
. Cesarean scar pregnancy: issues in management. Ultrasound Obstet Gynecol. 2004 Mar;23(3):247-253.
. Primary evacuation therapy for cesarean scar pregnancy: three new cases and review. Ultrasound Obstet Gynecol. 2006 Feb;27(2):222-226.
. Conservative treatment of complicated cesarean scar pregnancy. Acta Obstet Gynecol Scand. 2001 May;80(5):469-470.
. Successful conservative treatment of a cesarean scar pregnancy with systemically administered methotrexate and subsequent dilatation and curettage: a case report. Case Rep Obstet Gynecol. 2012;2012:248564. doi: 10.1155/2012/248564.
. Treatment of viable cesarean scar ectopic pregnancy with suction curettage. Int J Gynaecol Obstet. 2005 May;89(2):163-166.
. Transrectal ultrasound-guided surgical evacuation of cesarean scar ectopic pregnancy. Ultrasound Obstet Gynecol. 2010 Apr;35(4):481-485. doi: 10.1002/uog.7596. Outcome of cesarean scar pregnancy managed expectantly: systematic review and meta-analysis. Ultrasound Obstet Gynecol. 2018 Feb;51(2):169-175. doi:10.1002/uog.17568.